FREE SHIPPING ON ALL BONE SAW BLADES! Our band saw blades are made of hardened steel, providing long life and sharp edges, ideal for quick and straight cutting. We sell our blades at discount prices in groups of 5,10, or 15 at a time. Shipping is free within the continental United States. All blades that are 98" or less will be 4 teeth per inch. All blades that are 99" or more will be 3 teeth per inch. Experience has taught us that this ensures compatibility and eliminates errors. Please fill out the form at the bottom of the page to purchase blades. 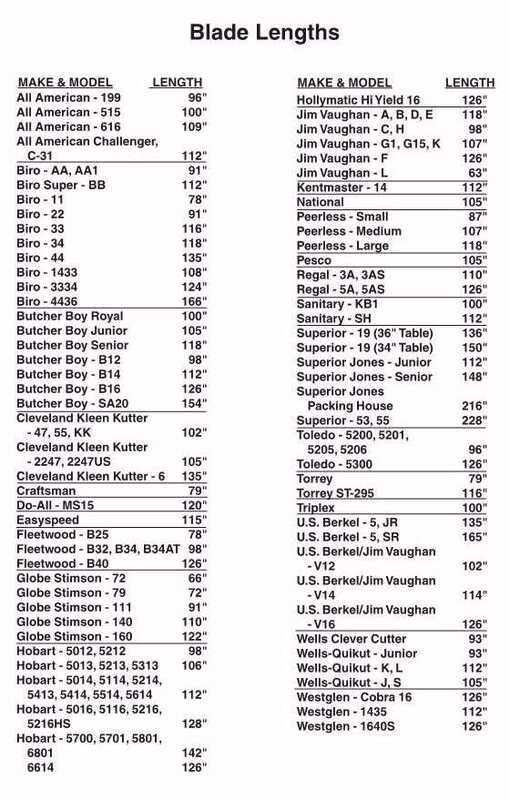 Use the chart to find the required blade length for your band saw.